(Nanowerk News) Lloyd’s of London, the insurance underwriter, has recently produced a report ("Autonomous Vehicles: Handing over Control: Risks and Opportunities in Insurance") about how autonomous car technology will affect the insurance industry. According to the report, insurance companies will have to create new methodologies on how they measure risk and charge motor insurance premiums. Recent headlines have been awash with stories of self-driving cars and futuristic flying devices. Visions of unmanned and autonomous machines are not new, however. Experiments with unmanned aircraft began in the First World War, and a radio controlled car was demonstrated in the streets of New York in 1925. 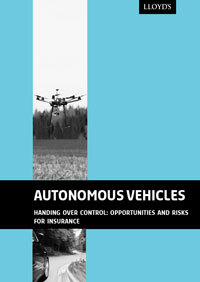 Nevertheless, recent years have seen considerable progress towards the goal of autonomous and unmanned vehicles. Such vehicles are an applied use of increasingly sophisticated artificial intelligence and robotics capabilities. These technological advances are allowing society to fundamentally reconsider the vehicles available to us, and the infrastructure which they are part of. This report looks at two major categories of autonomous and unmanned vehicles: (i) autonomous cars and (ii) unmanned aerial systems (UAS), as well as briefly considering other types of autonomous and unmanned vehicles. The development, as well as the commercial, public and consumer applications of these technologies will be considered, followed by the accompanying risks, and the foreseeable implications for insurers. The forces behind the development of these technologies are diverse, and represent how traditional transport industries can undergo changes in response to a new generation of machinery. Taking part in the autonomy race, in addition to established car and aircraft manufacturers, are global technological and idea innovators such as Google and Amazon, components manufacturers such as Bosch and Continental, small start-ups and university researchers. Their achievements could represent the biggest change to vehicles since the motorcar replaced the horse and cart. Unmanned vehicles can be defined as vehicles which are controlled remotely by an operator, or autonomously operated. Autonomous vehicles are vehicles which are capable of driving themselves. In order to do this, the vehicle must be able to perceive its environment, make decisions about where is safe and desirable to move, and do so. It can also be possible for a vehicle to be only partially autonomous, so that some decisions are made by a human driver, and some by the machine itself. With new technology comes new risks, and public fear and scepticism about autonomous and unmanned vehicles have not been insignificant. However, motivations for their development include increased safety, efficiency and improvements in quality of life and work. For instance, 93% of road traffic accidents are caused by human error, with 1.3 million fatalities and 50 million injuries every year globally. By replacing the fallible human driver with sufficiently capable technology, it is thought that collision rates will substantially decrease, with significant implications for safety. Beyond road traffic, autonomous or unmanned technology could be suitable for doing jobs which are “dull, dirty or dangerous” for humans. It has an almost inconceivable scope of applications and implications. Unmanned technology can go to places where people would be unable to, such as inside a volcano plume, or carry out repetitive or time-consuming tasks, for which people struggle to maintain concentration. Unmanned vehicles can also potentially be cheaper than the alternative of employing a team of people and a helicopter for an undertaking. The potential for change is great, and yet at the same time this must be balanced against the practicalities of implementation, and the achievement of adequate safety standards to mitigate the new risks that come with new technology. The lengthy considerations that would have to go into reworking laws, systems and infrastructure should not be underestimated, nor should public mistrust of putting lives in the hands of technology. The insurance industry’s expertise in risk management will be a factor in the adoption of autonomous and unmanned technology. In an area where regulation and safety standards are yet to be developed, insurers can encourage prudent progress by making their own risk assessments and providing policies for responsible operators. There is an opportunity for insurers to engage in the transfer of new risks, making it possible for continued technological innovation. This technological innovation may give rise to new business opportunities, with corresponding opportunities for insurers. Existing Autonomous and unmanned technology is sophisticated. It will continue to develop incrementally and become more commercially available. Autonomous vehicles are vehicles which can drive themselves without human supervision or input. Unmanned vehicles are vehicles which are either controlled remotely, or perhaps operate autonomously. Vehicles can also operate semi-autonomously: taking some control of aspects of their driving, whilst a human driver retains control of others. Autonomous and unmanned vehicle technology has already achieved a high degree of Development. Most modern cars incorporate features which allow them to operate semi-autonomously, while unmanned aerial systems are being employed for an increasing range of applications. The continuing evolution of this technology will expand its application across a large range of activities. Autonomous and unmanned technology is emerging gradually but continually, with new opportunities for its employment likely to follow in almost every industry. Widespread adoption of the technology will rely on well-defined regulatory frameworks and broad public trust on issues of safety and security. Incorporating autonomous or unmanned vehicles into existing legal and regulatory frameworks will present a major challenge. Additionally, there is significant public concern over safety and responsible use. Autonomous cars incorporate sophisticated safety features, but human input will continue to be a significant risk factor. Notwithstanding the transfer of control, humans will continue to be present in, or have supervision of, autonomous and unmanned cars. Training and education will be required to ensure that people who interact with these vehicles have the appropriate competence and awareness to ensure safe and responsible operation. Unmanned Aerial Systems (UAS) have a great variety of applications. Integrating them into already congested airspace and enforcing safety standards will be a major challenge. With much less requirement for fixed infrastructure compared to cars, UAS offer flexibility and adaptability which enables them to be employed in tasks ranging from aerial surveillance to crop management to parcel delivery. The integration of UAS into airspace regulation is proceeding unevenly, and will serve to slow the development of the UAS market. Insurance has a key role to play in enabling the development and adoption of the technology. Lloyd’s provided the first motor insurance policy in 1904, and has a strong tradition of developing new products to match innovations in technology. Insurers will have a significant role in assisting the development of sound risk management practices for autonomous and unmanned vehicles. Liability will be a key consideration in the development of insurance solutions. Autonomous and unmanned vehicles involve a transfer of control from direct human input to automated or remote control. This has implications for the determination of liability in the event of an incident, and will be a key factor in the pricing and structure of risk transfer. Do robot swarms work like brains?